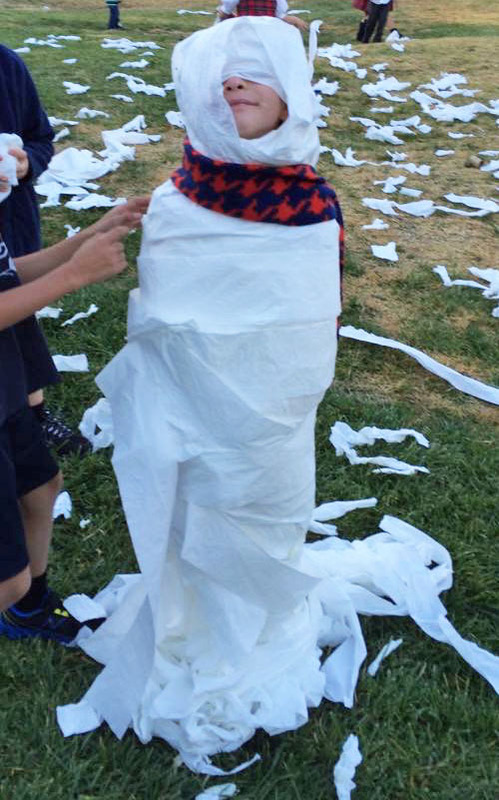 After almost a year-long blog sabbatical, I'm dropping off some photos of my son's Ninja Karate party from last July. Yep, I'm running about 6 months behind. :) I wish I could say that I am back to blogging regularly, but that won't be a possibility for at least 6 more months. And by then, I may have other plans… On a good note, the 3 big projects that I've been working on since last summer are finally coming to fruition. I can see the light at the end of the tunnel. Phew! So, here's our 7 year old's Ninja Karate Party. 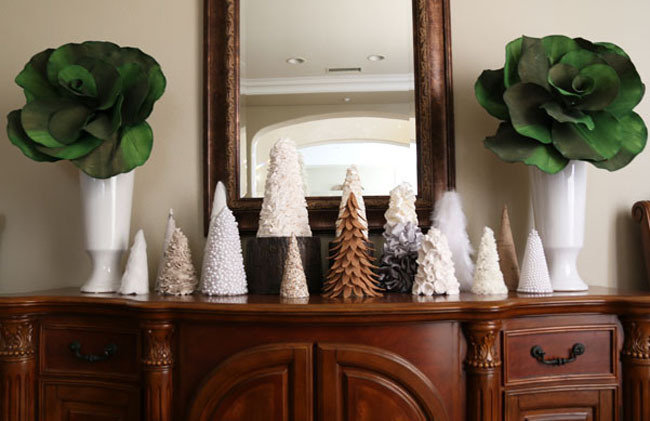 Very simple and easy decorations with big impact! 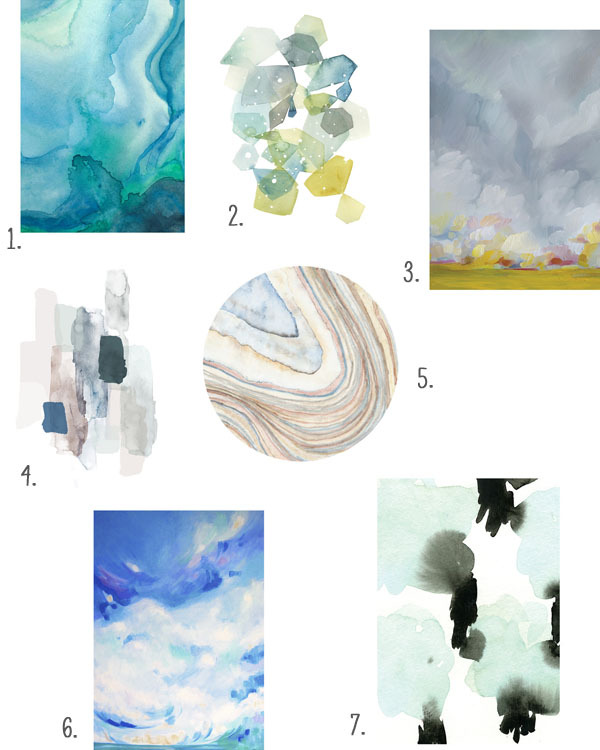 I was perusing the artwork selection on Minted's site when, ironically, I received an email from Minted asking if I would review their curated Art Marketplace. Kismet! I'm all about blogging with authenticity, so it was an easy "yes". 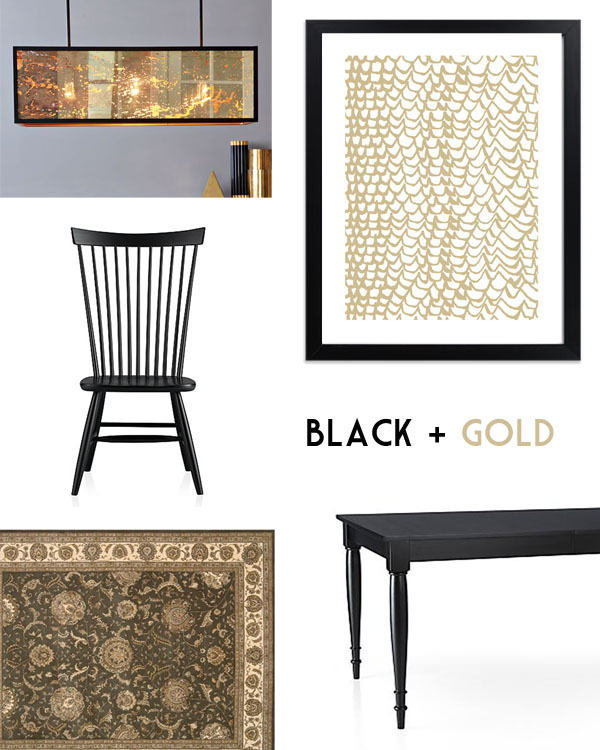 Redecorating our dining room has been on my mind for the past few years. We moved into our current home five years ago, and we basically just squeezed in our existing dining room furniture & accessories, then moved on to deal with more pressing issues. 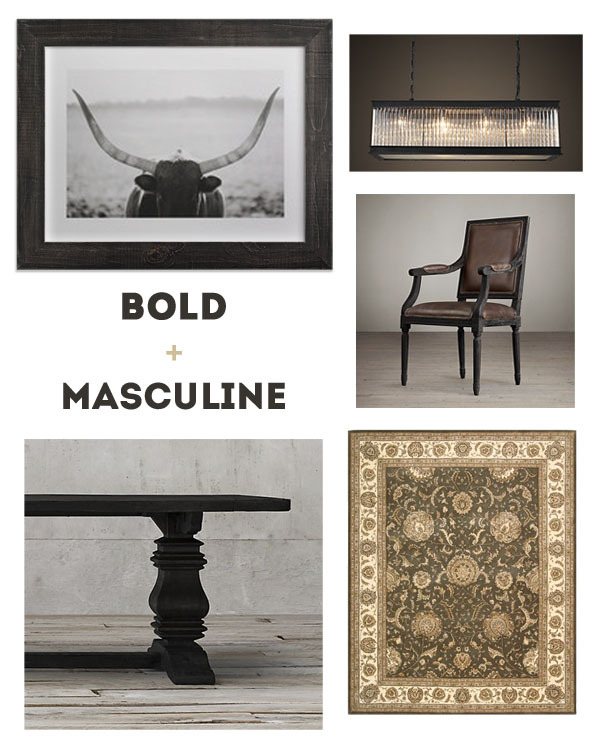 Our current furniture is big, bulky, outdated (think Tuscan circa 2001), uncomfortable and our dining room just doesn't work with the rest of our space. The artwork in the room is no better; Dark, heavy… Not inspiring at all. We've been making-do for the past 5 years and I think it's time to remedy the situation. Over the past few months I've been perusing various online art sites for inspiration. My plan? 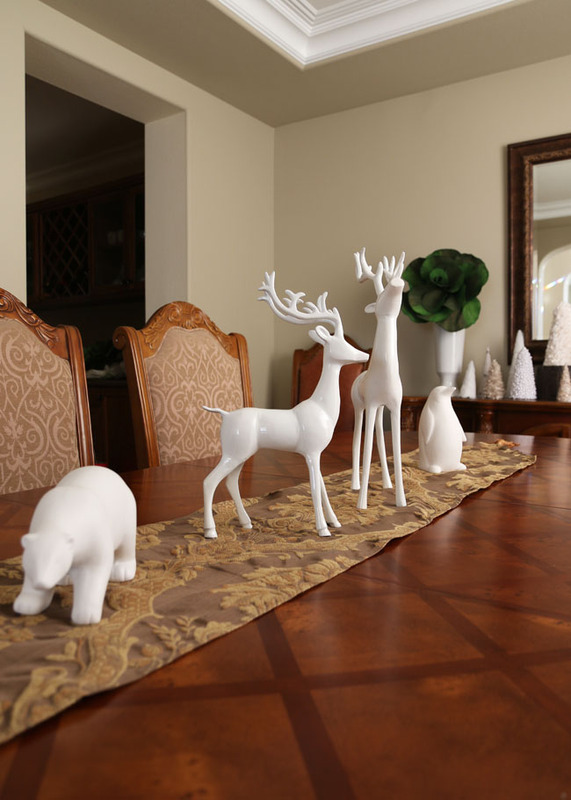 Find contemporary art & accessories and meld it together with timeless, useable furniture pieces. The only thing that I'm keeping is a silk & wool rug. 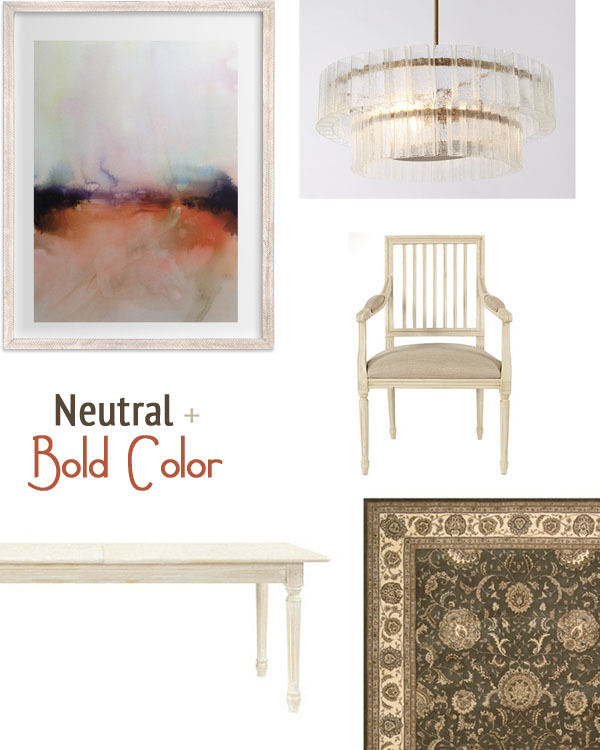 Luckily it is a neutral transitional piece and should work well with many contemporary styles. 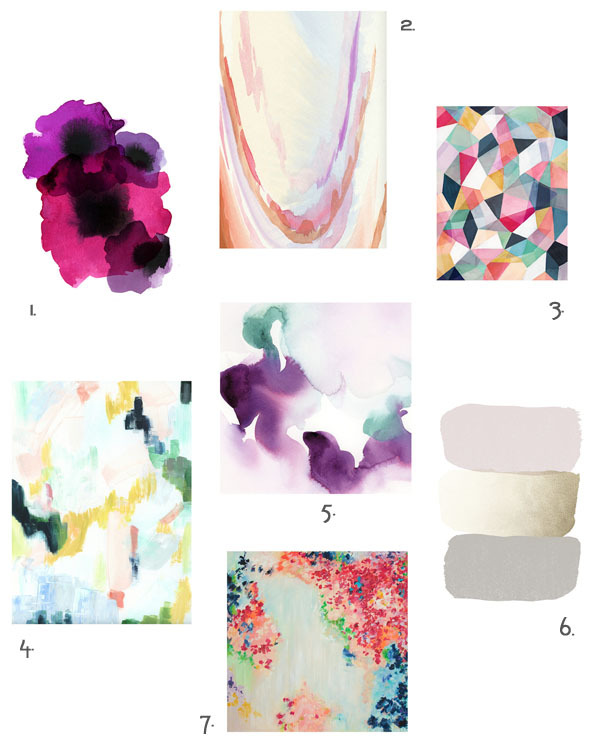 Using the artwork from Minted as inspiration, I came up with 5 different looks. Now the hard part… Figuring out what style to go with! I'm terrible about making big decisions. Someone chime-in and help me out! Aren't these strong, bold prints wonderful? They just demand attention. One color that just speaks to me is blue. I have splashes of blue in every room. 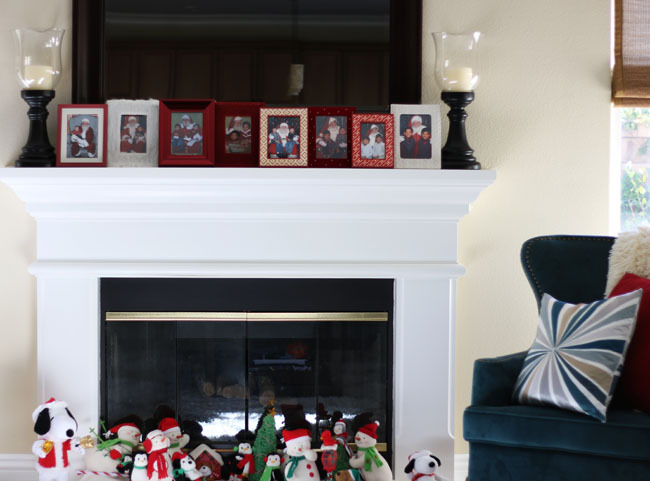 From a chair in a reading nook, to artwork in the living & great rooms. Calm and soothing, I love blues (and greys too)! What a goldmine of incredible art! 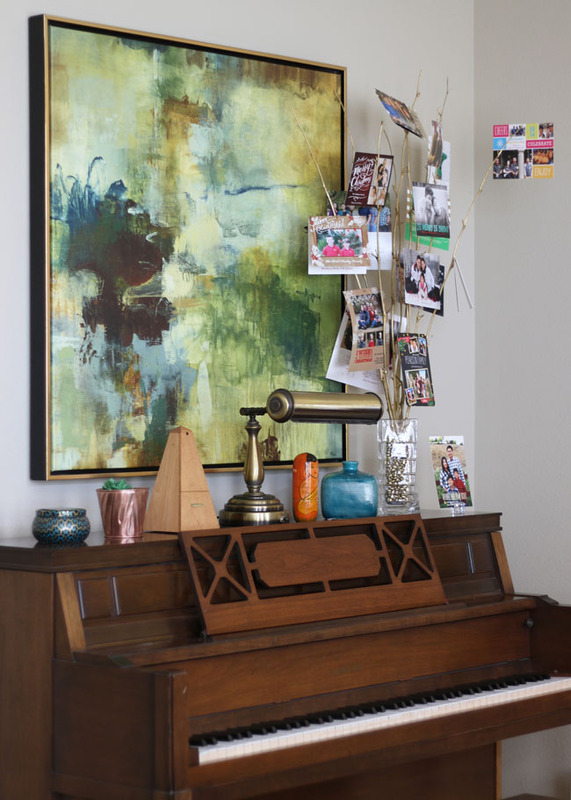 I've purchased some very cool cards from Minted in the past, so I am really happy to find the same quality of carefully curated and well-priced artwork in their Art Marketplace. 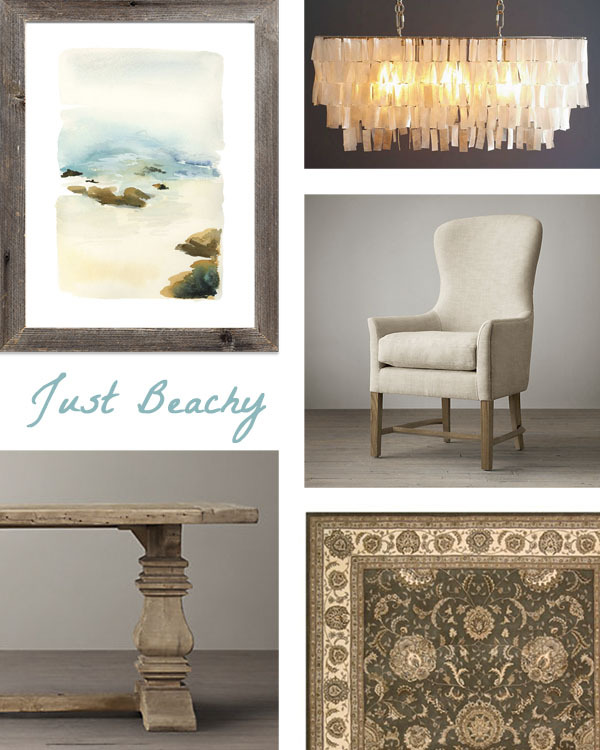 There are so many eye-catching pieces that I feel that the possibilities are endless… What say you? Any standouts? 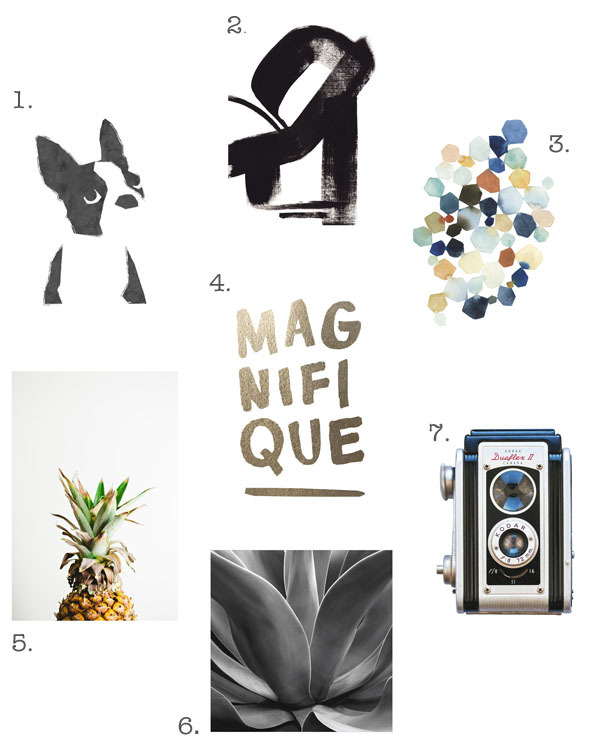 disclosure: This post is sponsored by the fine folks at Minted. As always, all opinions expressed are entirely my own. 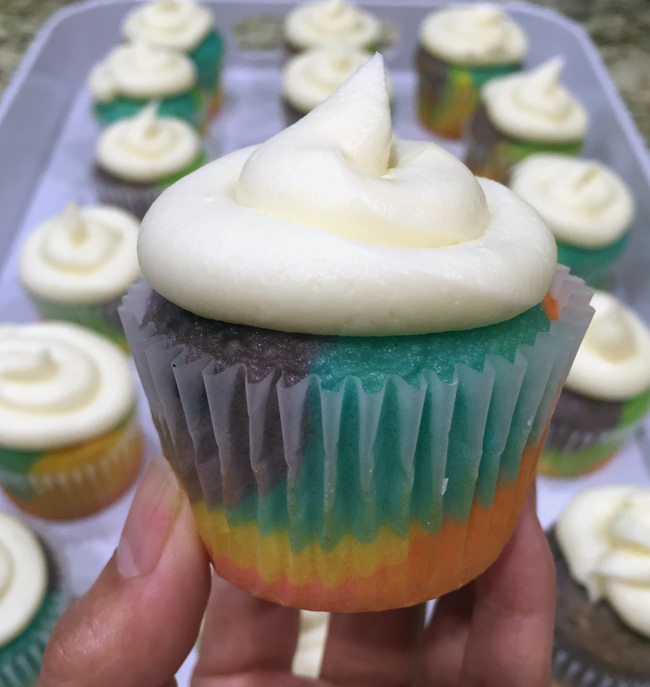 Yesterday the boys and I whipped up some easy Rainbow Cupcakes for a bake sale. 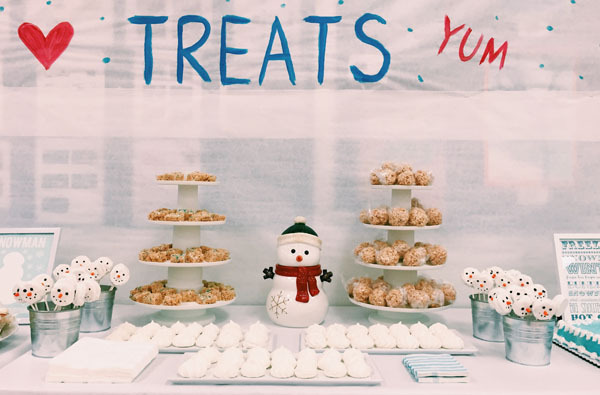 We are competing with donuts, a bake sale favorite, so this year we decided to take it up a notch. 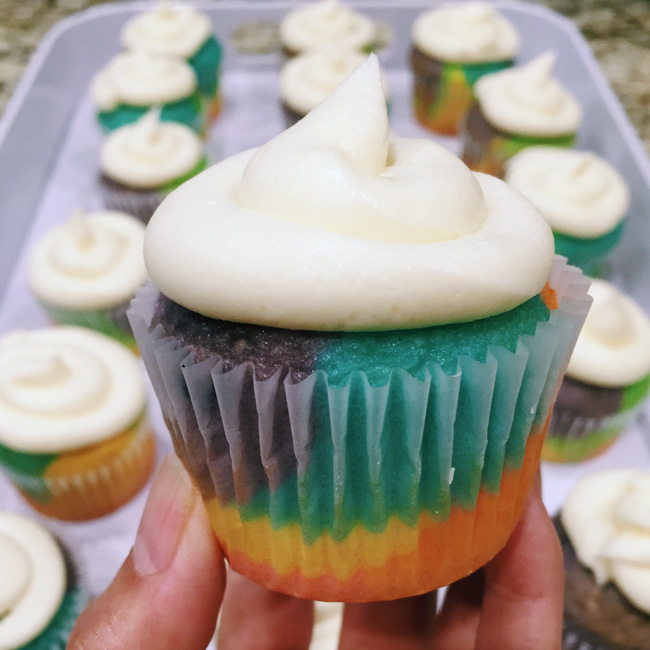 Yes it's still tastes like a white cupcake… but it looks much more fancy with a little lot of color! Buttercream Icing Mix (I used Wilton)… I don't usually like frosting, but this one was good. 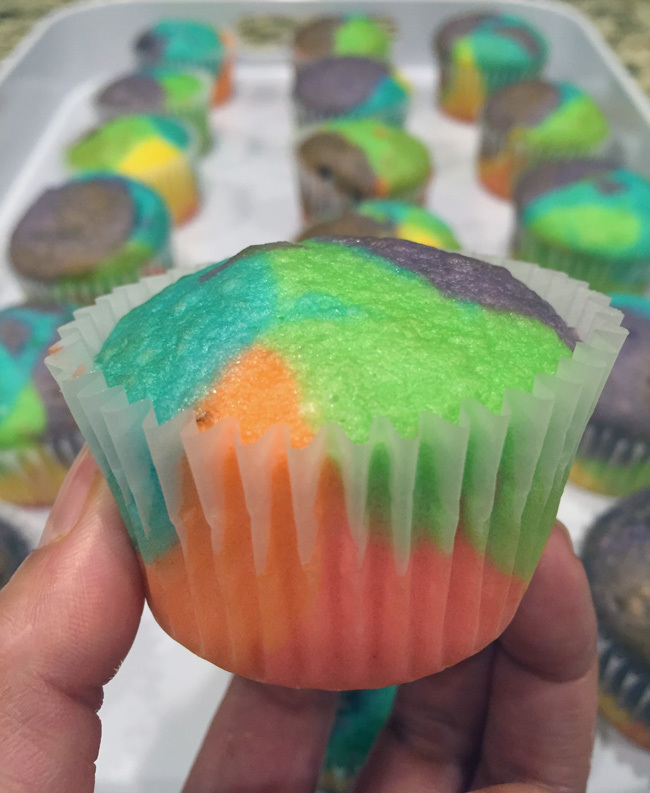 Food Coloring (I used Wilton Gel)… The color is very concentrated and you don't need much. Enlist the help of eager leprechauns to mix, stir & dollop. 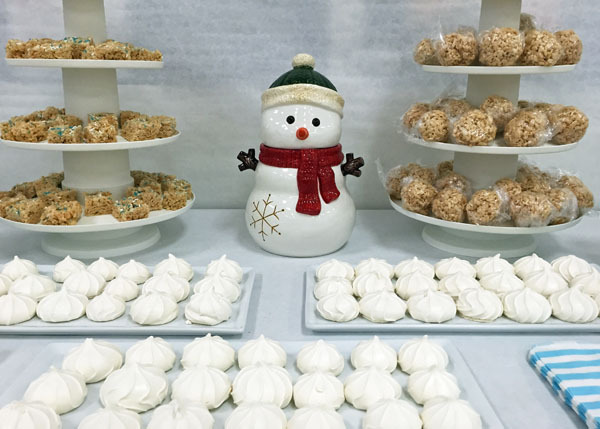 Let it cool then… Frost it. I didn't even bother with a frosting tip. I put the frosting in a ziplock bag, cut the corner and squeezed. We'll see how these do at the Bake Sale! It just occurred to me that the last time couple of times I've posted were also "holidays"… in February. Whoops, I really mean to post more often, but it's been a busy month (heck, a busy 6 months) and time keeps getting away from me. I do have a project that I'm working on… If it turns out I'll share it in the next week or so. 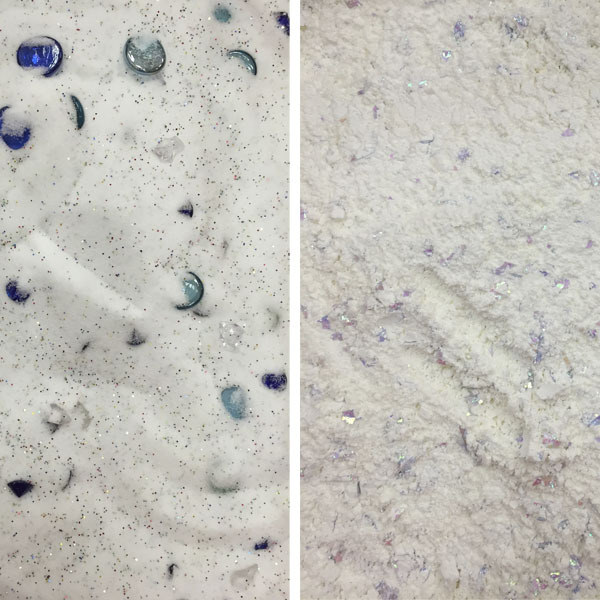 Crossing my fingers, because it's a science experiment of sorts. Have a great rest of the week! My six year old loves Minecraft, so this year we decided to make Minecraft Valentine's Day cards for his class. 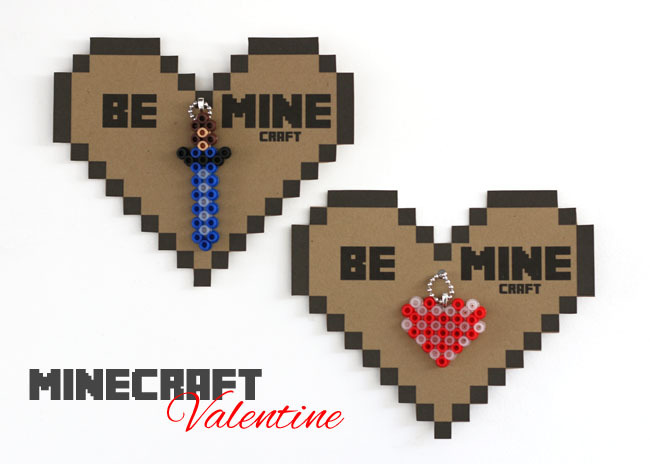 I kept it simple with swords for the boys and hearts for the girls-- All in the pixelated-Minecraft theme of course! Perler Beads lend themselves perfectly for this. I have to admit that I kind of like working with them-- slow, pedantic and somewhat relaxing if you're not in a rush. I had a bit of practice with Perler Beads when we threw a Minecraft-themed birthday party last summer (details HERE). You can obviously do a lot more with Perler Beads and the Minecraft theme-- Minecraft Creepers, Steves and Mobs, etc. 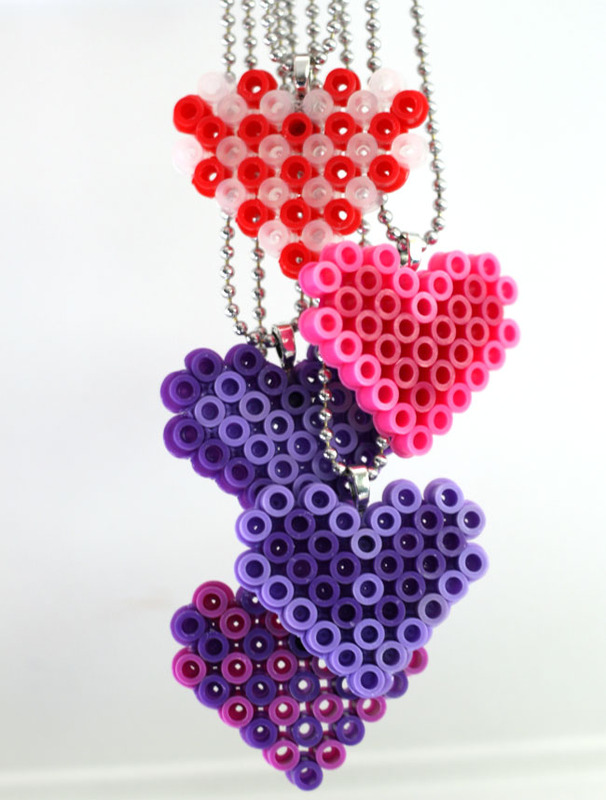 If you're looking for more design ideas, check out these Perler Bead cupcake picks. The beginning of a new year tends to lend itself to self evaluation. Am I happy? What am I doing right? What am I doing wrong? What can I do better? While I don't do huge resolutions (they just don't motivate me), I do like to reevaluate and make changes that are important to me and also attainable. Attainable being the key word there. So lets start with something simple, not deep at all, yet important in the overall scheme of health & happiness-- The Skin & Hair Routine. 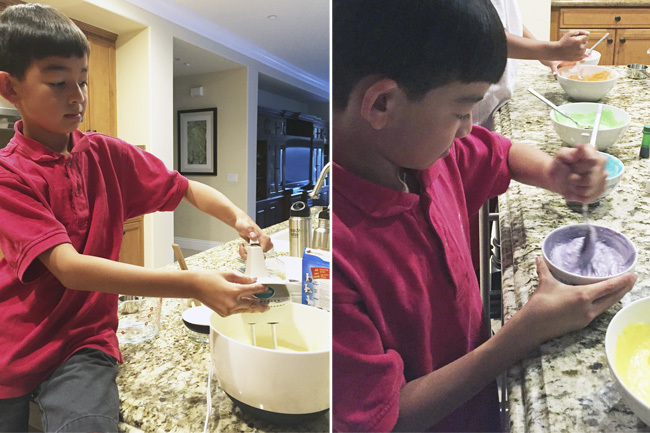 Over the Holidays I was battling a lot of germs-- basically a lot of gunk that the kids brought home from school. While I wasn't sick enough for a doctor's visit, I could tell my system was being tested-- Earaches, canker sores, achy joints, and the usual body-is-run-down ailments. And boy did I look tired-- my eyes, my hair, everything… TIRED! Even after I recovered, I realized that something needed to be done. I'm now approaching my mid-forties. Ack! Man, is it hard to type that. I don't always feel like I'm at that midlife point, but every now and then something happens, like looking at my tired ol' self in the mirror, and boy am I reminded that I am THERE. I've been using Argan Oil for a few years now, but after my recent midlife revelation, I decided it was time to take it up a notch. 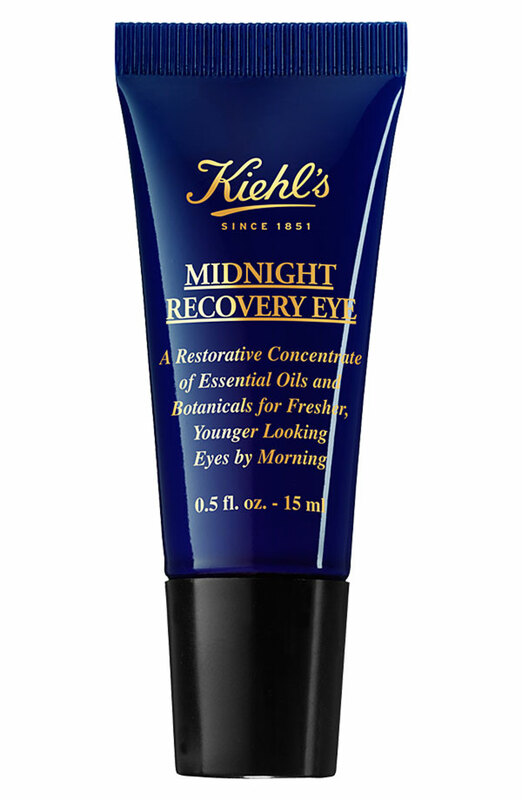 After polling friends and checking out my favorite blogs for suggestions, I decided to try Kiehl's Midnight Recovery elixir (an oil-based serum). It's been a couple of weeks and I have to say I actually noticed a difference right away. My skin has a little "spring" to it and the flakey spots are gone. My skin looks glowy and that break-out thing that was starting to happen along my jawline has gone away. So far, so good. Really good, actually. 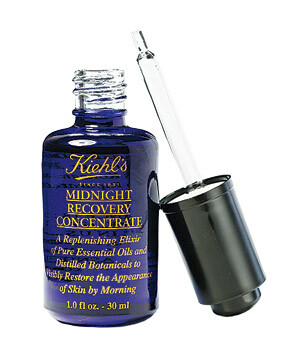 I also tried out Kiehl's Midnight Recovery Eye Concentrate, which goes along with the elixir mentioned above. I noticed almost immediately that the skin under my eyes is less-crepe-paper-like-- I hate that description, but that's pretty much what it looks like. The lines are still there, just less pronounced. My eyes also look less tired and the bags less noticeable. To be completely honest, I haven't used an under-eye cream in awhile. Everything that I've tried has either been too harsh-- causing rash/milia; Or I didn't notice a difference and just stopped using it. I have to say that this product has really impressed me. My only complaint? The tube is really small… However, I use very little and it covers well and is effective. I still love and use Argan Oil daily. My skin was pretty soft with just the Argan Oil, but the texture seems better and firmer after I started using the Kiehl's products. I use Argan Oil on my skin during the day and use the Kiehl's products at night only. I'll report back if anything changes, but so far, these products have hit all the marks! For my thick and heavy hair that manages to be greasy and prone to frizzies at the same time, I finally decided to bite the bullet and invest in a professional grade hair dryer and also try a new hair care approach. 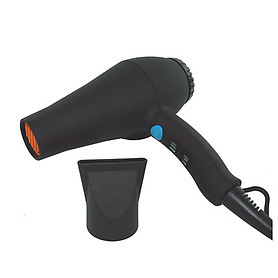 The hair dryer upgrade is long overdue… It's been on my list for several years now. I'm pretty lazy when it comes to my hair so I'm prone to letting my hair air dry (hence the frizzies) and rely on oil products to keep it looking somewhat tame. 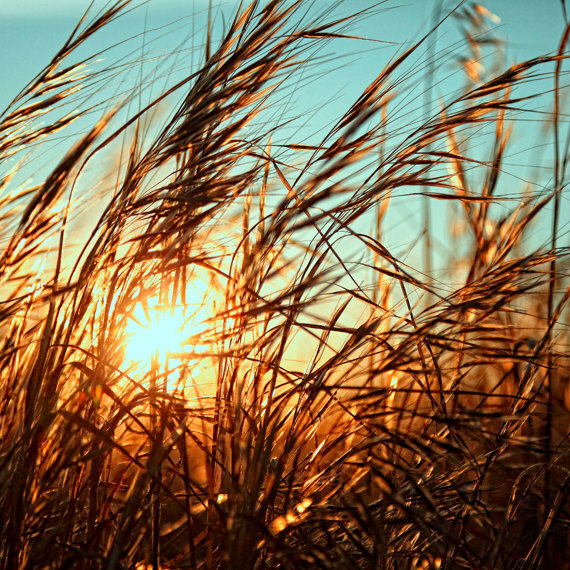 Sometimes it looks good… Often times it ends up in a pony tail. I'm all about simplicity so I was happy to drop the oil, smoothing creams and other shine enhancing products from my hair care routine. I was able to simplify with the combo of a good hair dryer and also the WEN cleansing conditioner that I just started using. I was given 2 large bottles of this stuff, so nothing out-of-pocket for me… When I looked online, it is pretty pricey. However, if you're replacing shampoo, conditioner & shine serum with one product, it's not too bad. I've been happy with the results, but will have to reevaluate after those 2 bottles are gone. There is a bit of a learning curve. For me, with my thick, grease-prone, long hair, making sure to thoroughly rinse-out the product is key. One positive is that I'm able to wash my hair every-other-day without grossing myself out-- I haven't been able to do that with a regular shampoo/conditioner. The only negative is that I don't care for the smell, but truthfully, I don't notice it too much when my hair is dry. I found that the best way to get it to work (the product doesn't foam) is get your hair completely wet, flip your head upside down, start rubbing the product into the roots/scalp and work it out to the ends. Flip your hair back, add a little more water and suds it up as best as possible. 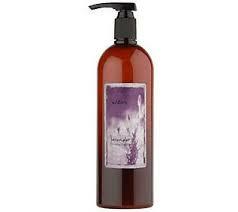 Let it sit for the duration of your shower and rinse out the product thoroughly at the end. Make sure all of the product is rinsed from your scalp-- otherwise it'll look greasy… Don't rush the rinsing part. Trust me on this one. The end result is smooth, shiny hair with no additional products or flat ironing. While I do love my cosmetics, I do know that it is just a small part of looking and feeling good. I subscribe to the inside-out theory-- If you eat well and are healthy, your skin and hair will reflect it. I can't say I'm strict about this and have been known to overdo the carbs and sweets, but I usually catch myself when I'm starting to not feel so great-- bloated, pudgy, just gross.. and get myself back on the right path. Last year I added natto to my diet. If you're into eating healthy and you've never tried natto, you should. It's sold at Japanese & most Asian markets. It does have a distinct flavor, but now I crave the stuff. In a nutshell, it's fermented soybeans and has a sticky texture and an umami flavor-- earthy is how I usually describe it. I eat it over hot rice with tea, furikake (Japanese rice seasoning), and tsukemono (Japanese pickles). It is chock-full of all the good gut bacteria and nutrients for a healthy bod. So after the holiday goodies finally ran out (that box of See's nuts and chews is my downfall), I'm ready to get back to a healthy diet and start out 2015 on the right foot. 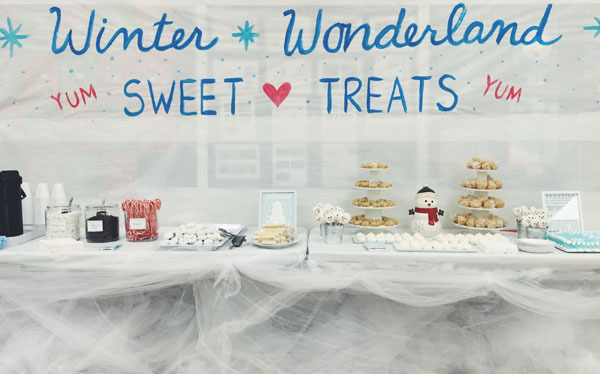 Last week I helped organize and throw a Winter Wonderland Party at my children's school. sorry about the pink tinge, I went crazy with my VSCO phone app. The main event? 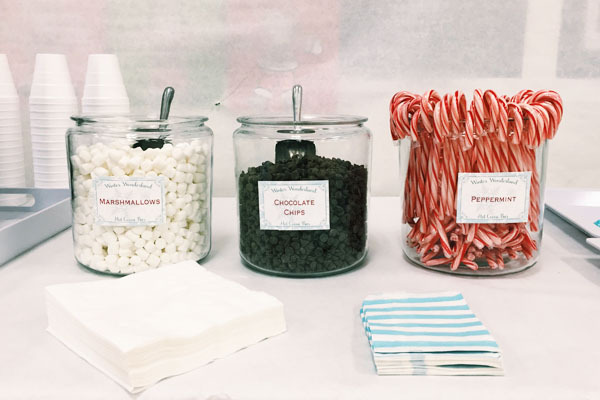 The dessert table and hot chocolate bar! 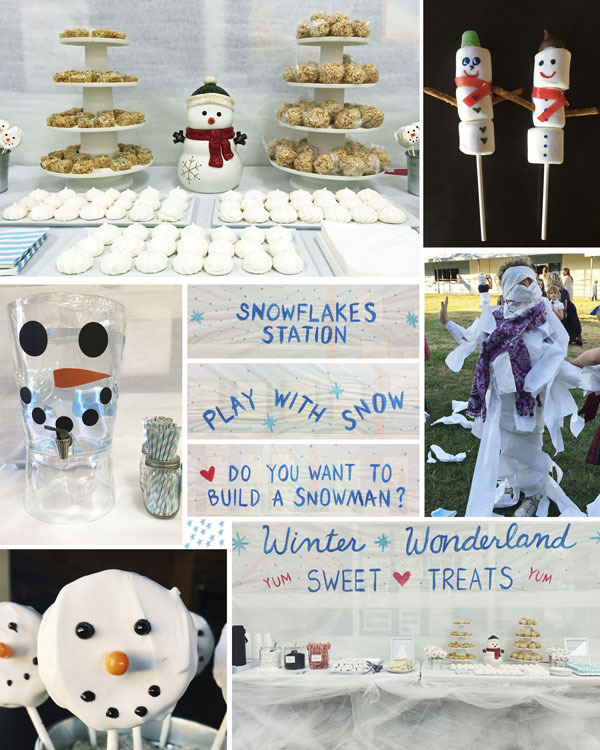 Considering that this party was for 100 elementary school kids and we pulled it off with 5 days of planning… I have to say that this party was a SUCCESS! That said, I don't think I've ever been so happy to see a party over and done with. Phew! And we did it all with a $300 budget. We came in under-budget actually… Not too bad! 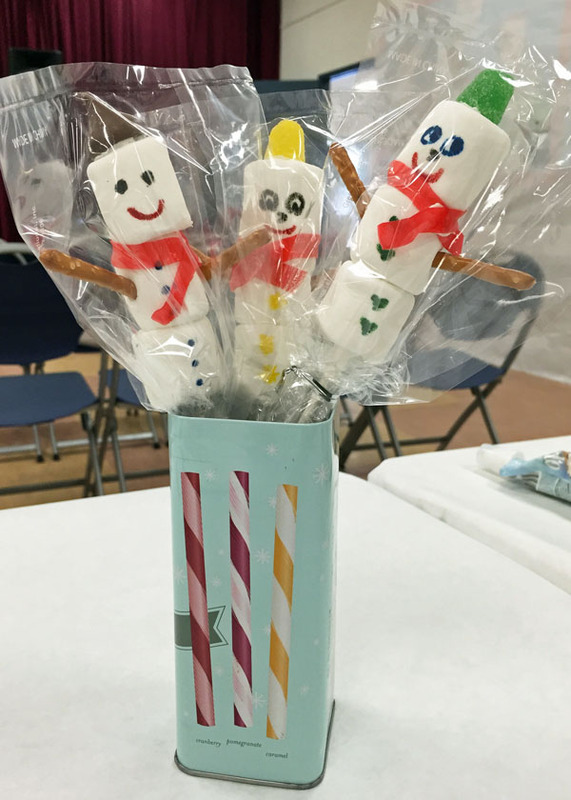 4) these 6-inch long "cake pop" sticks were perfect for holding everything together. Talk about stressing out though! I guess I could've planned ahead and worked on it during Winter Break, but seriously, and I hate it when people say this but… "Who's got time for that!". I started planning on Monday, hit the stores on Tuesday & Wednesday, prepped on Thursday, party on Friday. 5) coloring table. we also let the kids color the walls since they were covered with white paper. 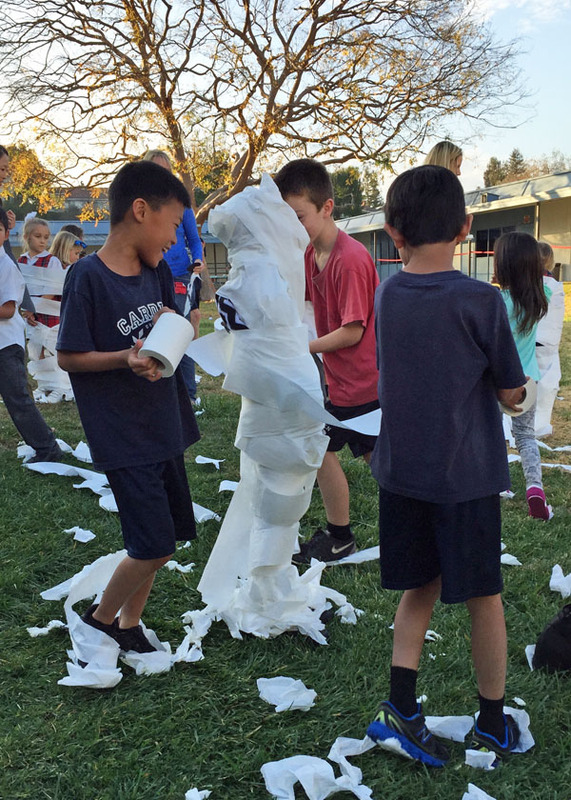 Thank goodness for the parents who ran the outdoor activities. 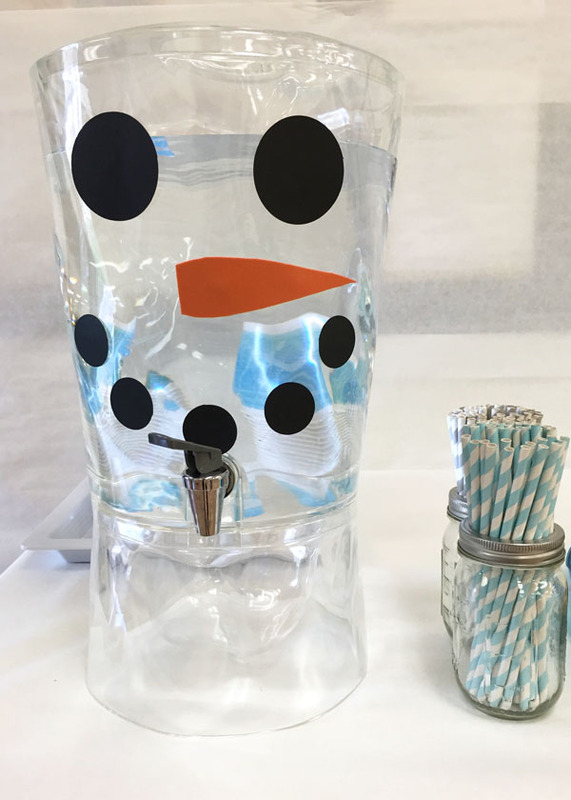 Because 100 kids coming at you after ingesting a lot of sugar is just… trouble. 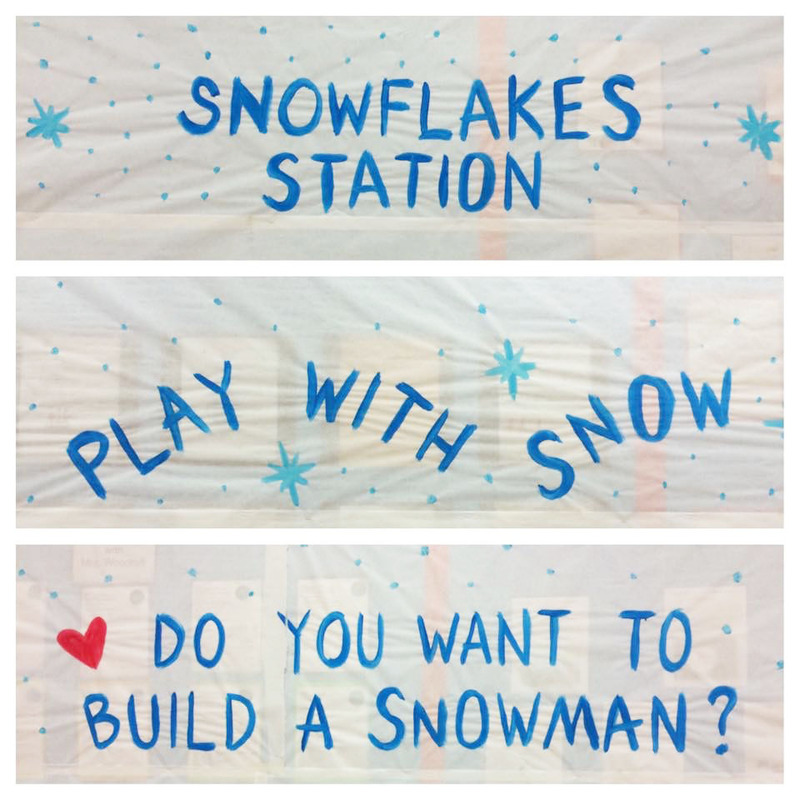 "Build a Snowperson" activity (BIG HIT!!!). Snowball Relay Races with large spoons and this cool Snowball Fight set. At the end, it was just a massive "snowball" fight. We also had a bubble maker (it's uber cheap and still running after 5 years of abuse) for the younger kids. I turned it on and they chased bubbles. Also a Big Hit! Well hi there! Don't mind me. 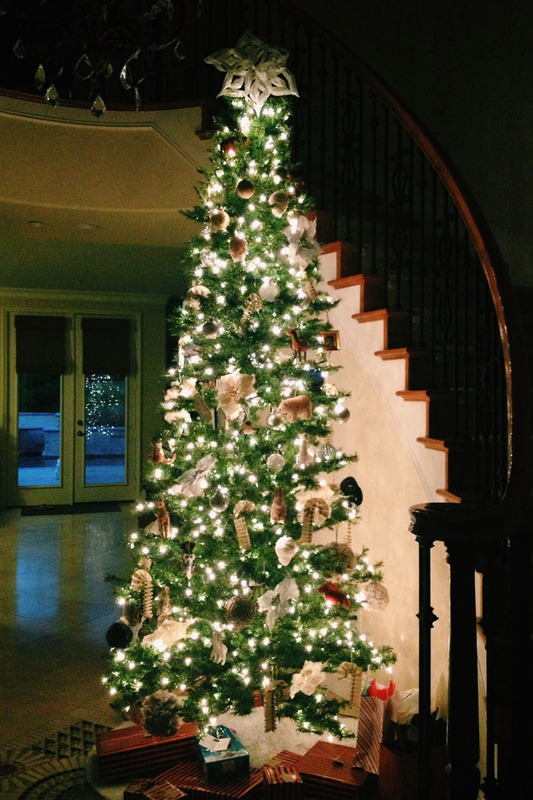 Just dropping off a few photos of our 2014 Christmas Decorations. 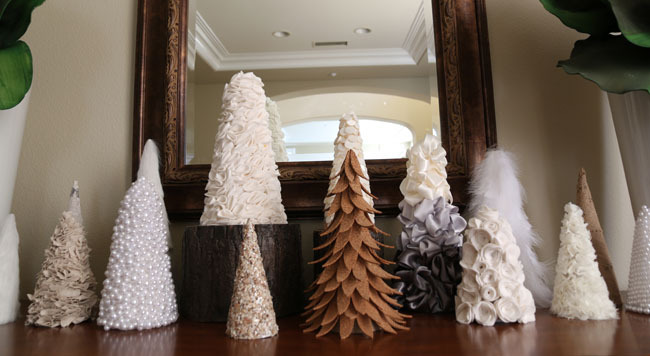 So lets talk Christmas decorations. 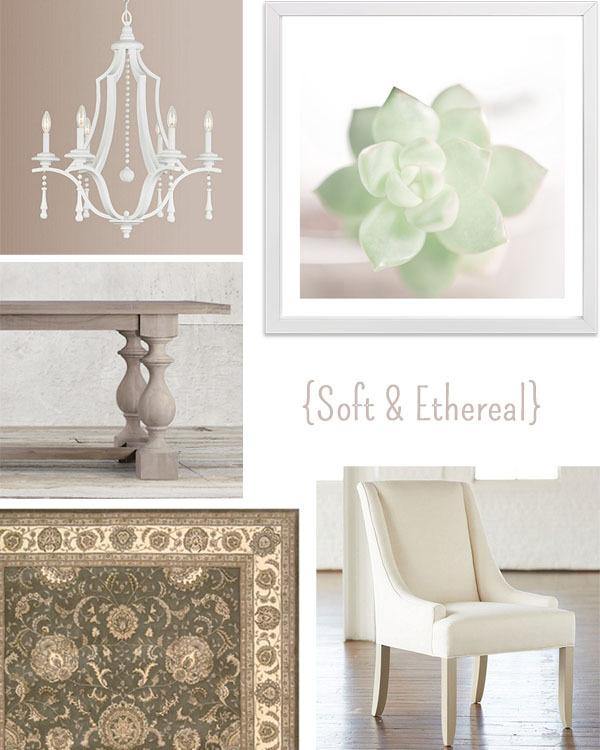 I still love my neutrals. 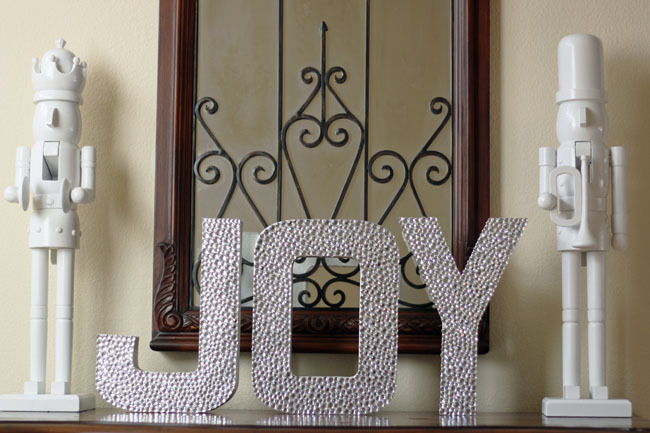 What began as burgundy & gold decorations in 2009 have completely transformed into creams, beiges, and a variety of metals-- I couldn't decide on just one metal. I'm an equal opportunity metal-lover. Not so much the music though. Unless in small flashback 80's doses. 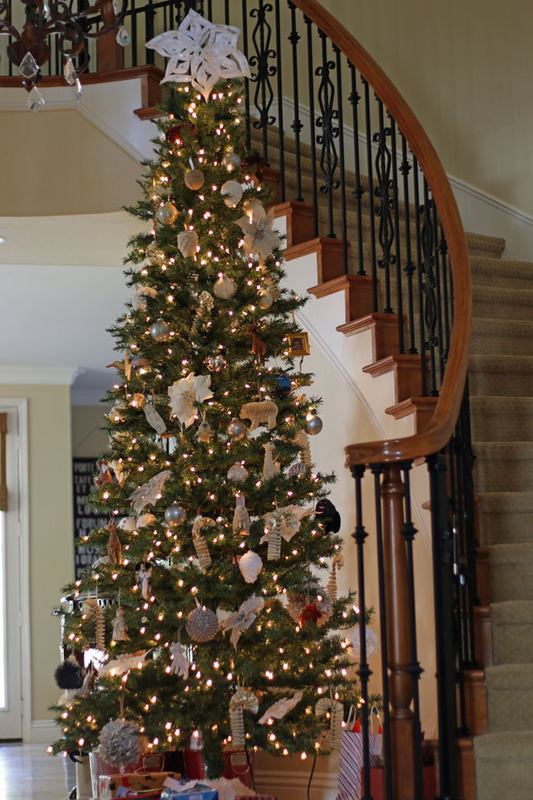 It was a slow process, but the decorations all came together this year. I didn't craft a single thing this holiday season. Nope. Nothing. Hallelujah! 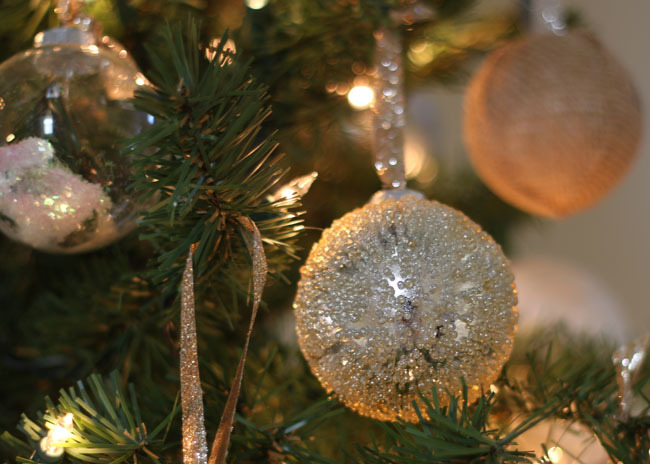 I meant to take photos and post this holiday stuff earlier in the month, but time just got away from me. Time is a slippery sucker. I also meant to crank out posts in the months of October and November… I even started writing something down. Then I got distracted, lost interest and said… ah fahgettaboudit. End of story. Where was I? Oh… I'd also like to promise that I will post more regularly in the new year, 2015 (!!! ), but I don't like to make promises that I can't keep. I will try. How about that? Trying is good. Right? 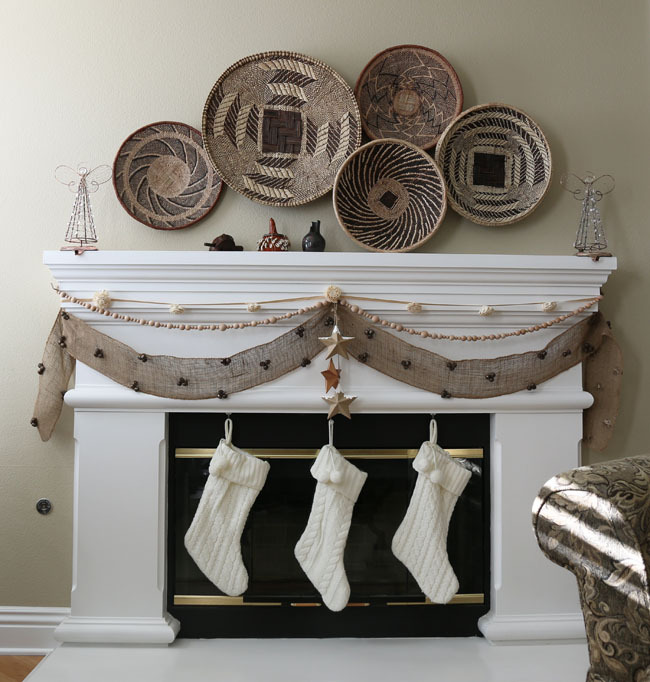 more about the African Baskets here and here. I didn't mean to take two weeks off but, life happens and then suddenly it's two weeks later. In my last post, we were "transitioning" into a new routine. Well, I guess we're as transitioned as we'll ever be. So I find myself with a 1st & 3rd grader. Add school and homework, the random play date or birthday party, and that's pretty much our week. 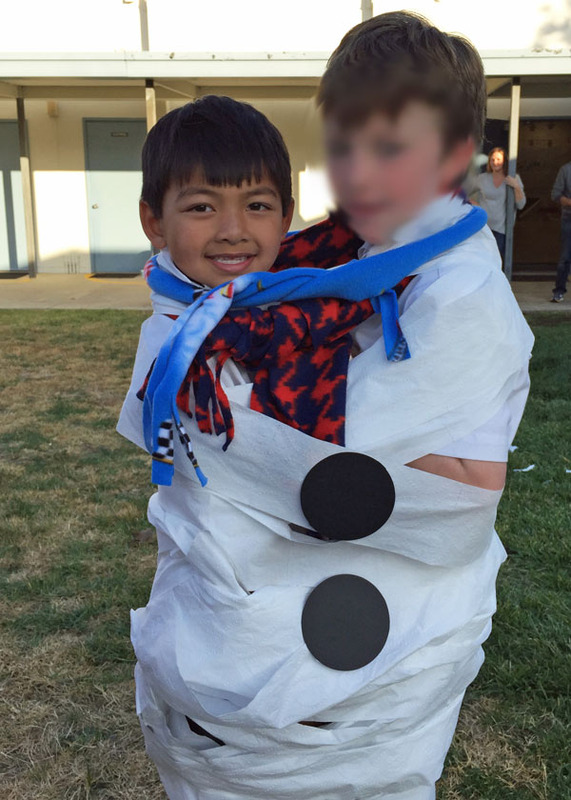 Tack on my decision to handle the fundraising for the kids' school. I've had my head buried in spreadsheets, verbiage and strategy since school began. The last two weeks we've also had family and friends in town, visiting from other countries. Hong Kong and Brazil to be exact. So cool to have and maintain these long-distance relationships. The crazy week-long heatwave finally broke and today it finally feels like Fall. I can't put away the shorts and tees just yet, but at least I can start thinking about *flannel* *plaid* *boots* and *wool pants*. 10 steps to make your child smarter. Unlike most lists, this one is backed by science and actually makes sense. Have you ever tried grilling lettuce? I love grilled cabbage… and this grilled romaine salad appeals to me. A fun way to customize some dollar store balloons. And here's where you think I've gone completely nuts… The cutest snail ever. We have one in our aquarium… Fun to watch and smarter than our fish. I'm re-thinking our dining room and this chandelier has me intrigued. I swear by argan oil and use it day and night to keep my sensitive skin happy and dewy soft. This alternative to the pricey josie maran version gets my stamp of approval… and I like the pump better than the medicine dropper. Hope you're having a nice weekend!! !